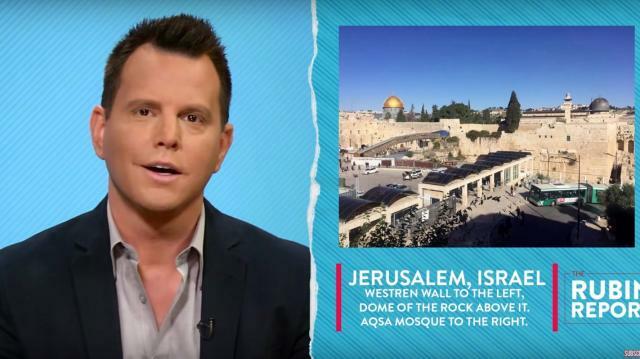 Dave Rubin talks about his trip to Israel, the coexistence he saw there, and why we can't give into fear. "The world is in a strange fearful moment right now.We can either give in to our worst impulses or try to be better." Stay tuned for clips from Dave's interview with Nick Cohen coming today, 12/9, tomorrow 12/10 and the full interview Friday 12/11. Oh man, there is a ton to talk to you about this week.As you probably know, I was in Israel last week where I was invited to speak at a video conference. The remainder of the week was spent wandering the streets, talking to people about peace and eating ridiculous amounts of hummus. Spending most of my time in Tel-Aviv, I saw people of pretty much every race, color, religion, ethnicity and nationality living side by side.I heard Hebrew, Arabic, English, French, Spanish, Japanese, German and several other languages being spoken simultaneously in restaurants and cafes.I saw coexistence in a part of the world that has very little of it. I also spent a day in Jerusalem. If you saw the video we posted, I tried to show how close these religious sites are and give a little context to an extremely small yet complex city. Walking through the old city of Jerusalem, I explored the Jewish and Christian Quarters, and stopped for falafel in the Arab quarter. I felt it was important to not just talk about these places, but to also live them. I exited the old city at the Damascus gate, where only a day before a Jew had been stabbed. While there was no doubt the neighborhood was tense, there was also a feeling that this was life, and life goes on for all. Unfortunately, I also heard about the San Bernardino terrorist attacks while on the beach in Israel. It was incredibly surreal to be so far away from something so horrific happening 60 miles from where I live, while being 7,600 miles away from home. Adding to the surreal feeling was that I was in the epicenter of a country dealing with terrorism in some form or another virtually every day. Suddenly, I had people asking me what it's like to be in America with all our mass shootings. The world felt completely flipped on its head. On the 14 hour plane ride back to Los Angeles, I read "What's Left", by my guest this week, Nick Cohen. Nick Cohen is a writer for Time, Spectator, Observer and Standpoint. His first book, Whats Left, is an absolute must read if you dig what we do here. Though "What's Left?" was written in 2007, Nick absolutely nails so much of the lunacy we've been talking about on the left these days. From their dishonest tactics of lying about opponents views to aligning themselves with people who would just as easily have them killed. He goes on a journey through history to show how the far left has so often strengthened the very ideas they purport to be against. There were so many passages of the book that felt like they could've been written today that it was almost like reading the future. He nailed the Regressive Left before the term was even out there. Speaking of the regressives, you didn't think I was gonna get through a show without mentioning them, did you? One of the issues I've called them out on is if they don't stop smearing the liberals willing to talk about Islamic extremism, that they will hand the future to the far right. We're already seeing this across Europe as far right parties are winning elections and gaining in the polls -- from France to Belgium to Sweden and more. This is clearly coming to American shores now too, as Donald Trump this week called for denying Muslims entry into the United States. Obviously this is an idiotic, over the top statement, but it can only exist in a climate where fear of real discussion has been limited. If we aren't afraid of talking about Islamism, especially the difference between people and doctrine, then we can finally have an honest conversation about refugees and immigration. But if we do as the regressives are doing this very second, by making no distinction between people who are trying to talk about serious issues versus people who trade on fear, then we help the real xenophobes and silence the reformers. Even as a kid, I always loved John F. Kennedy's famous quote, "We have nothing to fear but fear itself. "It's lofty and big, but it hits a very human feeling. Sometimes fear in things is scarier than the actual thing itself. That's not to say Radical Islam isn't scary, but we also feed that fear if we don't deal with it honestly. Now, though, we live in a time when people are incredibly fearful -- and much of it is with good reason, as we've seen the spread of evil ideology with no signs of letting up. That doesn't mean we should be afraid to speak up against it or silence those who dare do to that. Actually, of course it means that exact opposite. Fear is what the regressives and the far right will use to splinter us against each other so they can gain power. The world is in a strange fearful moment right now.We can either give in to our worst impulses or try to be better. I think you know which side I'm going to choose. As we sat in a packed restaurant in Tel-Aviv, I asked a friend about how he feels about all the stabbings. Without missing a beat he said, "we have to keep living, we have no choice." I think we could all use a little of that spirit right now. Let's not give in to fear fed to us by terrorists or fear fed to us by politicians. Let's keep fighting, because if we don't, choice is exactly what we'll be giving up.